When we read, we discover what we do not know. 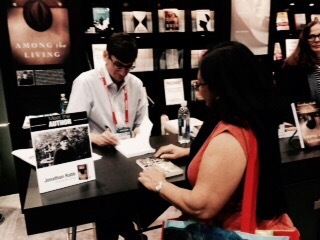 Jonathan Rabb, the American author, was pleasantly surprised.I queued up for his autograph at the BEA 2016. I pointed to the Combined Book Exhibit at the entrance of the book fair. I devoured his proof in one gulp.His book ‘Among the Living’ was not published yet. A captivating love story of unequal beauty…set up in a land unknown to me until I came to the last page. This entry was posted in Autograph, Book fairs, books and tagged beauty, Book fairs, books, Knowledge, newhorizons, reading, Stories, Vision, writing by Anita Bacha. Bookmark the permalink.